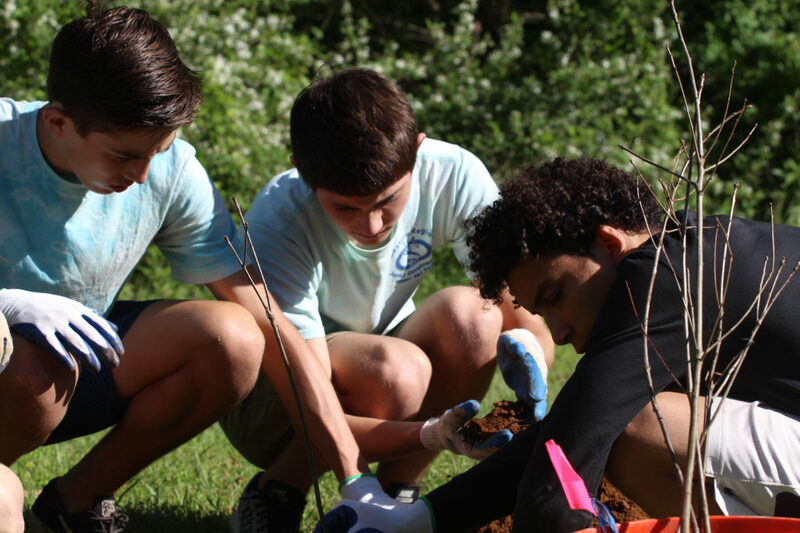 Orange County High School students planted 85 trees to establish a forest buffer along the Rapidan River. Photo by Grace Wilbanks. As an FOR educator, one of my main goals is helping students feel confident in the outdoors and empowered to make a positive difference. This past year, we had a day that exemplifies that mission. 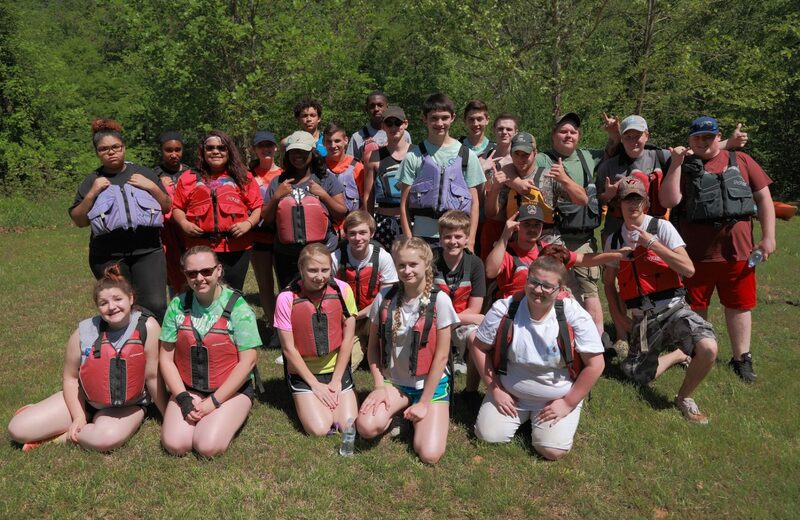 We went out to the Rapidan River with 25 ecology students from Orange County High School for a Plant ‘n’ Paddle field day, and combined restoration, education, and recreation into one exciting day. We began the day by planting 85 tree saplings along the river to establish a forest buffer, which improves water quality by filtering runoff and creating habitat for aquatic organisms. As the kids started digging, the field began to buzz. They soon realized that the ground they were standing on was full of bees, emerging from holes in the ground! Understandably, the students were a little freaked out. An FOR educator stepped in and calmly explained that the bees were plasterer bees– Colletes inaequalis— which nest individually and are therefore much less likely to sting than hive-based bee species. The kids looked at each other, shrugged, and went on digging. 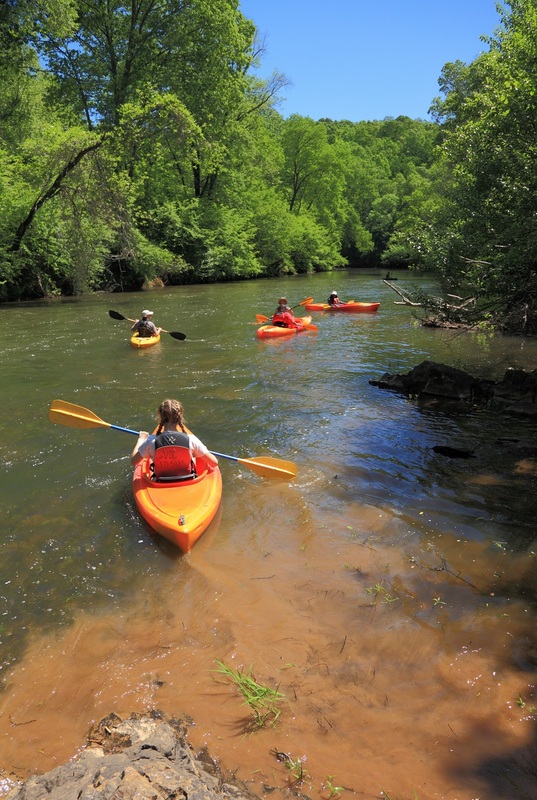 After planting, the students kayaked a 4-miles stretch of the Rapidan. Photo by Mike Lynch. Once the planting was done, we moved on to the paddle. We put our kayaks in and started downstream. Soon, we encountered a series of rapids. One boy, Marcus, was in a kayak for the first time in his life. Somehow, Marcus (standing 6’3″) was assigned a kayak that was cartoonishly small for his tall, lanky frame. On the first rapid, Marcus bumped a rock and swamped his kayak. On the second, he caught an eddy and tipped over. On the final rapid, he ducked to avoid a low-hanging branch and fell completely in. I felt awful. I pulled over to help Marcus empty his kayak and began to apologize profusely for the undersized vessel we provided. I was surprised to find that he wasn’t angry or upset. In fact, he had a huge grin on his face. We laughed and hung out as we waited for the water drain from his boat. Once a child learns to explore outside without fear, the natural world becomes a playground instead of a haunted house. When a young person gains the confidence to plant a tree in a field of buzzing bees, she’ll be less likely to reactively smash a bug the next time she sees one. If Marcus can go home with a smile after falling in the river three times, he’s more likely to take his own children out paddling someday. So when I lead a field trip, I feel like I’m reaching more than just the 20 kids in front of me. I’m reaching their children and their children’s children. If I do my job right, I can break the cycle of fear one family at a time and plant a seed of love and appreciation for nature. And that’s my goal as an FOR educator. All the students who participated in the field day. Photo by Mike Lynch.